Vespa Velutina is one of the most common species among the Asian hornets. A interesting information about Vespa Velutina is that is a native of South East Asia. It is slightly smaller in size when compared to its European counterparts, and its distinct appearance makes it easy to identify it from the other species. Like all hornets theses are colonial creatures that have a hierarchy of the queen, drones and workers. The average worker grows up to 25mm in length and the queen grows up to 30mm. The dark brown abdominal segments with a velvety black thorax can never be missed. Only the fourth segment is orange in color. All segments have a fine coating of yellow which distinguishes it from the other hornets. 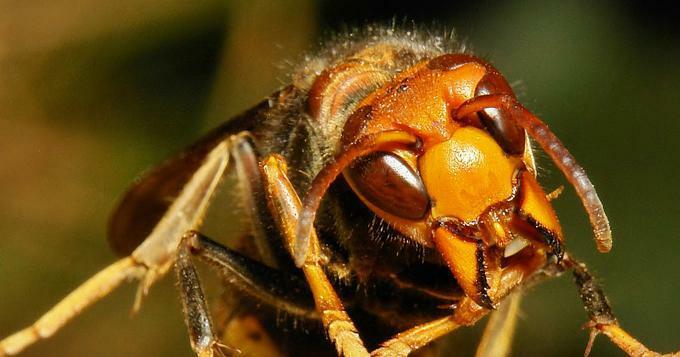 An orange and yellow face on a black head and blackish brown legs are the other prominent features of this hornet family. The following Video of Vespa Velutina hive was filmed at Viana do Castelo. It was first spotted in France and then now in Portugal. European Honeybees are in danger due to this change in ecology. Here is another Video of it in Hong Kong, Lantau Island. The short Video caputures the deadly hornet in a beautiful way. Looks can be Deceiving !!! 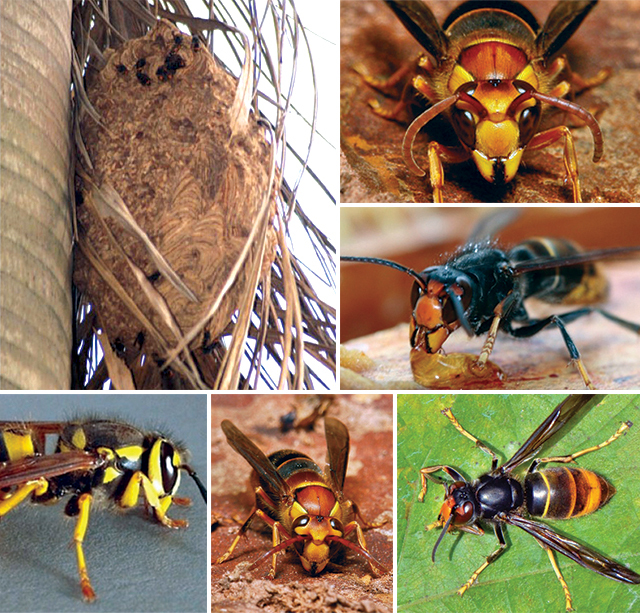 The colonial and nesting practices are in line with the other hornets. The nest lasts for only one season and the fertilized queens hibernate through the winter only to build their colonies during the subsequent spring and summer months. The drones are used only for mating purposes and the entire colony dies in the early part of winter. The queen first builds its nest during the spring in low bushes and shrubs. As the colony grows the size of the nest becomes inadequate to hold the entire strength. The later part of the season, a new nest is built in higher places like tall trees and structures. This nest is bigger than the first one and it is here that the young queens are hatched. The new nests are built within the vicinity of the old nest. Vespa Velutina is a predator of all kinds of insects but its favorites are the honey bees and flies. They are one of the best hunters among the hornets and have admirable flight skills. They pose a threat to honey bees and thereby pollination. vespa-bicolor.net is a good resource, the website is however down at the moment.